Samichlaus changed my life. Okay, I realize that’s a lot to say for a beer. It was already a very big deal to be in Hong Kong for the first time. My very good friend who was living and working in China gave us more than a few surprises during that five day trip. Besides developing nearly fluent Mandarin in less than six months, he introduced us to this very peculiar beer. 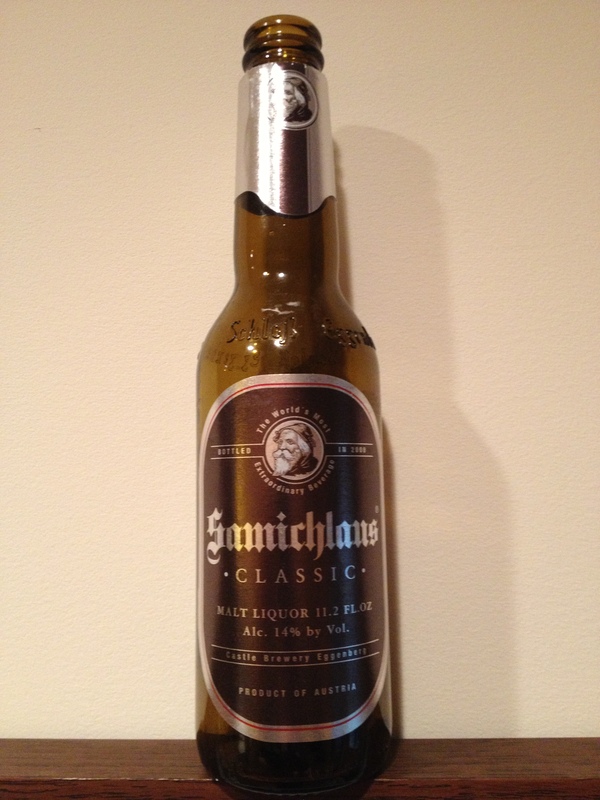 It’s safe to say that Samichlaus is one of the strongest beers in the world. It can’t compete with some of the very high ABV (alcohol by volume) offerings that BrewDog, Boston Beer Company and Dogfish Head have put out in the past few years, but it certainly still packs a very strong punch with a 14% ABV. Samichlaus, which means Santa Claus, is brewed once a year on St. Nicholas’ Day (December 6th). It doesn’t taste like a typical beer for the folks out there who are accustomed to drinking “light beers” like Lagers, Pilseners, and such. Officially a Doppelbock, I would describe the taste as leaning towards a Sherry or Port Wine. The strongest beers that most breweries conjure up stop at 12% ABV. Most brewer’s yeast goes to “sleep” at 12% ABV, that is the conversion of malt sugars into alcohol by yeast hits a wall at 12% ABV. According to the beer historian Roger Protz’s research, the brewery’s researchers and scientists worked for several decades to culture a strain of yeast that would continue to work its magic past 12%. In 1979, the new yeast culture was used to make a very special Christmas beer. For over 30 years, Samichlaus has created quite a buzz. After finishing a second round of Samichlaus, I knew my beer palate was forever transformed and I subsequently threw in the towel for the night. Thank you, Santa and Master Wah for introducing me to a world of much better beer.